3D CBCT, OPG x-rays and highly detailed, digital intraoral x-rays can all be done at our practice for the most comprehensive view of your teeth, jaw and sinuses. plaque and calculus build up will be removed from your teeth and under your gums. We use both ultrasonic and hand scalers to provide you with a thorough clean. all photos taken will be shown to you to help explain any treatment and to create a comprehensive record of your teeth. to reduce teeth sensitivity and to strengthen and re-mineralise teeth. At Mona Vale Dental we prefer not to have to fill teeth if we don’t have to – the best filling material is natural tooth! However, bacteria can cause decay in our teeth and this means that at times we may have to do a filling. We use tooth-coloured fillings called Composite Resin that are both tough and good-looking. We try to remove as little natural tooth as possible during the process, and retain as much of your natural tooth, and select the shade of filling that best suits the natural shade of your tooth. This way we make sure that the filling blends into the rest of your mouth. Crowns and bridges are an excellent way of restoring aesthetics and full function to teeth. ​Teeth that have over 60% filling are weaker than a natural tooth and cracks develop, especially if you have a strong bite. If left untreated these teeth can splinter and potentially have to be extracted. ​When a tooth needs to be reconstructed or strengthened, a crown (cap) is sometimes made. The natural tooth is reduced in size and a ceramic crown is placed over the top of the tooth by the Dentist to restore the look and function of the tooth. ​Although there are aesthetic benefits to this treatment, the main reason for placing crowns is to strengthen damaged teeth so they can withstand the large forces we exert on them when we eat. We use crowns that are extremely strong and give a superior cosmetic result, as well as a natural appearance. ​Bridges are an option for replacement of missing teeth. A crown is placed on each of the teeth either side of the missing tooth, and another crown (joined to the two crowns) sits over the gap. This way, the missing tooth can be replaced. Partial and complete dentures can be made for patients who are missing one, many, or all of their teeth. If you need a tooth taken out and don’t want to be without a tooth we can have a denture made so that it can be placed immediately after an extraction. There are many styles of partial dentures and one of our dentists can determine which is the best option for you. Do you ever wake up with a sore jaw, stiff neck or even with back trouble? Have you noticed small cracks in your teeth? There are many possible reasons for this, but one of may be that you are grinding your teeth while asleep. This can affect up to 20% of the population, with 80% of these not aware that they do it. ​The signs are often evident in your mouth, such as cracked fillings and teeth and generalised sensitivity. There are many reasons why this occurs, and we try to uncover some of these during your treatment and look at ways to address them. 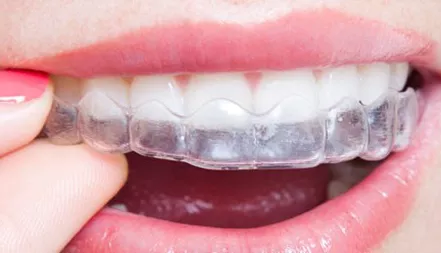 We can also construct you a bite guard, or Occlusal Splint or night guard, to minimise the impact on your mouth. Mouth guards are an essential item if you play any contact sports. They help to lessen the forces caused by blows to the head, helping to protect your teeth and jaw from fractures. If you’d like to know more about our services or our practice please contact us today to book an appointment.